Upon Jeremy Borash's departure from Impact Wrestling to WWE, there was a massive void to be filled- one at the commentary desk. Sonjay Dutt assumed the position of Josh Mathews' fellow commentator, and the two men have done an exemplary job ever since. 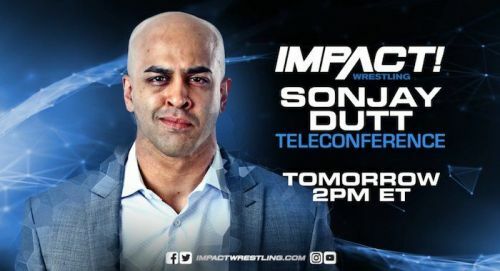 Sonjay Dutt caught up with media from across the world during a recent media teleconference. We had a chance to ask him three questions! When you do recover from injury do you plan to continue at the desk or go back into the ring once again? Dutt: Great question. You know what, I've not totally decided on what my future is. I've spent eighteen years in the professional wrestling business as an in-ring performer... pretty much half my life at this point. So, half my life I've spent in the ring and this has been the longest period of time that I've not stepped in the ring. So, I'm coming up on twelve weeks since my surgery. So, it seems like an eternity but I've got a lot of stuff that on my plate and added to that is stepping into the booth with Josh every week. So, I do miss wrestling. Don't get me wrong. I do miss wrestling. But there's a lot on my plate right now and when the time comes to where I can get back in the ring when I'm fully recovered, I'm kinda looking at it as a bridge I'll cross then. I wanted to ask you about EC3's promo at the conclusion of 'Feast or Fired'. How much of it was scripted and how much of it was off the cuff? What did you personally think of the segment? Dutt: I thought it was a good segment. I thought it accomplished what it needed to accomplish. As far as the verbiage that EC 3 delivered, I think at the end of the day, EC3 is an extremely creative guy. I think he's extremely gifted on the microphone. I think he's very gifted with using his words to get across a story. And I think he did an excellent job at the Feast or Fired segment. I spoke to Rosemary recently and she spoke about Jimmy Jacobs helping her out from a creative aspect. How instrumental has he been, behind the scenes? Dutt: Jimmy came aboard in November when he left WWE. Scott D'Amore and I were talking. Scott D'Amore and Jimmy go back to maybe when Jimmy got back in wrestling. So, we've known each other for fifteen years. Jimmy and I have worked on the independent scene since 2002-2003. Scott and I were both of the same mindset. We said- 'Hey, let's reach out to Jimmy'. Jimmy came aboard in November. He's been part of the writing team. He's been part of creative. He's helping produce matches. He's helping produce promos. And, his strengths are definitely being felt at the tapings. Just take the example you used with Rosemary. Jimmy's very tuned in, he's very dialed in and it's good to have Jimmy. He's a very creative mind. Catch Impact Wrestling, only on SONY ESPN and SONY ESPN HD. Send us news tips at fightclub@sportskeeda.com. Exclusive: Petey Williams discusses Rich Swann, the X-Division, breakout stars and more!